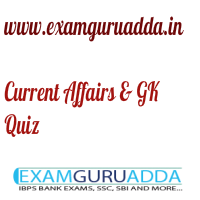 Dear Readers Examguruadda.in presents Current Affairs quiz of 7-8th December 2016 that cover important current affair events. Current Affairs quiz prepared according to the latest Bank, SSC and other competitive exam. 1. Who won the 2016 Turner Prize? 2. Who will succeed Justice TS Thakur as Chief Justice of India? 3. How much amount will be provided by NITI Aayog to every district to encourage digital payment system? 4. Who was declared as Person of the Year 2016 by Time Magazine? 5. When is the Armed Forces Flag Day celebrated in India? 6. Which parliamentary constituency recently became India’s first to have health insurance for all? 7. The 2016 India-Arab Partnership Conference will be held in which country? 8. Which is the most powerful language according to the 2016 World Power Language Index (PLI)? 9. Which Indian bank has been adjudged the “Best Bank for SME Lending” by Assocham? 10. “Resourcesat-2A” remote sensing satellite has been launched by which launch vehicle?